The town of Amalfi Italy is located on the picturesque Amalfi Coast between Sorrento and Salerno. If features some interesting tourist attractions and landmarks including the Duomo, Bell Tower and beach. There are also several interesting art galleries and museums and a beautiful seaside promenade. 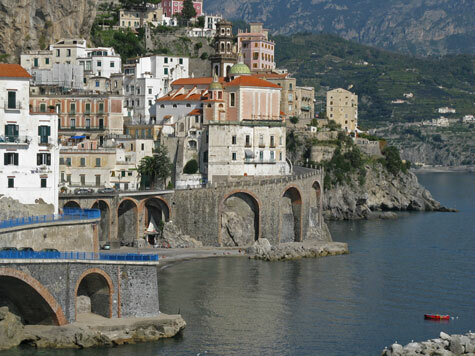 Frequent coach service operates to Amalfi Italy from Sorrento, Positano and Salerno. Passenger ferry service is also available to Amalfi from these communities and also from the Island of Capri. The road along the Amalfi Coast to the town of Amalfi is breath taking, and equally so is the driving! A number of excellent hotels, pensions, and guest houses can be found in the town of Amalfi. Many tourists enjoy staying in Sorrento or Salerno and then making a day excursion to Amalfi. Please explore our site to learn more about this spectacular region of Italy.